This is is the place where you will get completely pampered and leave fully rejuvenated! Agua offers a completely new spa experience including luxury sauna facilities, massages, anti aging and beauty treatments. Get a break from your busy and stressful life. Walk in or make an appointment to reconnect with yourself. You deserve it! At Agua Eindhoven we think that a warm welcome, hospitality and personal attention are self-evident. In addition to that we use the best products, latest technologies en newest trends from New York, London and Paris. Our qualified and specialized staff not only provide treatments but also offer help with the development of a healthy lifestyle. Agua Eindhoven offers yoga, pilates, nutrition advice and guidance with weight loss. For men, we have a special Men’s Room. You can come in for a shave or get your hands and feet taken care of. Of course, you can also book all of the other treatments that we offer. At Agua Spa Health & Beauty, everybody is in good hands! Click here for our wide range of packages. Relax on our sunny rooftop terrace including luxury bathrobes, towels, and high-quality care. Get spoiled @ Agua! Would you like to stay informed about Agua? Please subscribe to out special newsletter with many advantages, offers and exclusive invitations. Enter your details here and we will keep you in the loop! 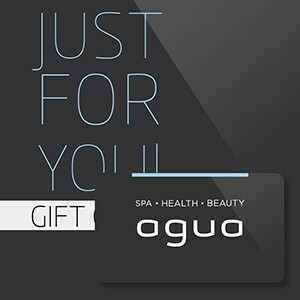 A giftcard from Agua city spa is exactly what you are looking for. Since the gift card is custom made, you can pick a specific treatment or amount. Because of the luxury packaging and the ability to add a personal message this gift will be fun to give and even better to receive!